UPDATE (4/23/11 - 12:22 P.M.): It saddens me to report that pizza maestro Noel Brohner has left 31Ten after a mere three months in hopes of opening up a joint of his own in the near future. Brohner says he is looking in both the Santa Monica/Venice and West Hollywood areas. Excited for his new spot, but definitely disgruntled the beachside's best pizza may never be the same... More updates to come. Santa Monica is a great place to visit/live/love. Unless you want pizza. A city bestowed with great burgers, seafood, people watching and views, the Monica seems to have it all. Except for pizza. The city does not receive low marks on their pizza exam for lack of trying. Hell, there's a pizza spot on almost every damn corner. Dagwoods, The Slice, Abbot's Pizza, Wildflour, to name a few. There's even Joe's Pizza, the Bleecker Street transplant, perfectly located smack dab across the street from the mighty Pacific. With their signature sweet sauce, Joe's makes a mean pie. There are a few problems with Joe's though: inconsistency and the aforementioned location. New York-style floppy 'za is meant to be served in slices and Joe's consistently over reheats their slices. I would say three out of five times this occurs; which, in turn, toughens up the crust and makes the slices impossible to bend properly. So if the only way to receive top notch Joe's pizza is by ordering a whole pie, well, that leads me to problem number two: location. This serene setting obviously comes with a lofty monthly rent; subsequently, the pizzas are flat out too expensive. $21 for a large pepperoni pie (*I think it's a "large," they only have one size) is probably $3-5 more than any other top pizza joint in LA. Which is no big deal every once in a while, but if it's the only pizza joint in town worth eating, then it slowly takes a major hit on your wallet. Which is why I was so delighted (check that, ELATED) to find a new pizza joint opening in Santa Monica. Actually 31Ten is more a bar/lounge serving tastes from all around the globe, but it will quickly be known for its wood-fired pizzas. And rightfully so - they will soon be known as the purveyors of the best pizza in Santa Monica. The pizza oven portion of the kitchen is headed by Noel Brohner. How does a Jewish kid from the Valley end up running a wood-burning pizza oven for Italians (31 Ten is owned and run by the guys behind Venice Beach's Ado)? Let's just say Noel did his homework. An almost two year odyssey of schooling, apprenticeships and observation at the likes of the French Culinary Institute in New York (to learn about artisanal bread/dough making), pizza kitchens in Napoli and Roma and finally an extensive excursion working at the West Village's famed Neapolitan pizzeria, Keste. All that training has paid off. Cooked at around 900 degrees (note: they aspire for Keste-like 1150 degree temperatures! ), the little-too-large-for-one-person-but-I-ate-it-myself-anyway-pizzas take a little less than two minutes to cook. Then, out comes awesomeness. Perfectly Neopolitan leopard-spotted throughout, the tasty and spongy crust lets off that somewhat burnt aftertaste all great Italian pizzas do. The toppings are top notch also. Pictured above is the Prosciutto and Funghi. I also recommend the Pepperoni and Peppers. The sauce, although slightly chunky, is very light and not overpowering. *P.S. Also looking forward to the new LGO pizza joint on the opposite end of Main Street. 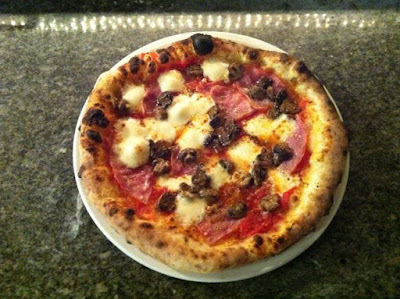 LGO's Pasadena pizzeria, The Luggage Room, serves some tasty 'za. Can't wait to taste a bit of Noel's talented, pizza making artistry!